Well, you can guess from my lack of posting how insane life got as we moved back to the USA. I started my own little ebook formatting company, E.M. Tippetts Book Designs - well, it started out little. It's now four people strong and we've formatted one New York Times bestseller and several USA Today bestsellers, and clients keep on coming. And now we're branching out into science fiction, which is back to my roots. It only makes sense that I announce giveaways on this, my science fiction website. 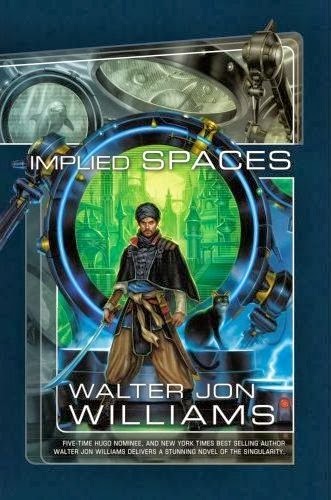 And to kick it all off, we're giving away a signed copy of Implied Spaces, by the Nebula Award winning author, Walter Jon Williams. Aristide, a semi-retired computer scientist turned swordsman, is a scholar of the implied spaces, seeking meaning amid the accidents of architecture in a universe where reality itself has been sculpted and designed by superhuman machine intelligence. While exploring the pre-technological world Midgarth, one of four dozen pocket universes created within a series of vast, orbital matrioshka computer arrays, Aristide uncovers a fiendish plot threatening to set off a nightmare scenario, perhaps even bringing about the ultimate Existential Crisis: the end of civilization itself. Traveling the pocket universes with his wormhole-edged sword Tecmesssa in hand and talking cat Bitsy, avatar of the planet-sized computer Endora, at his side, Aristide must find a way to save the multiverse from subversion, sabotage, and certain destruction.